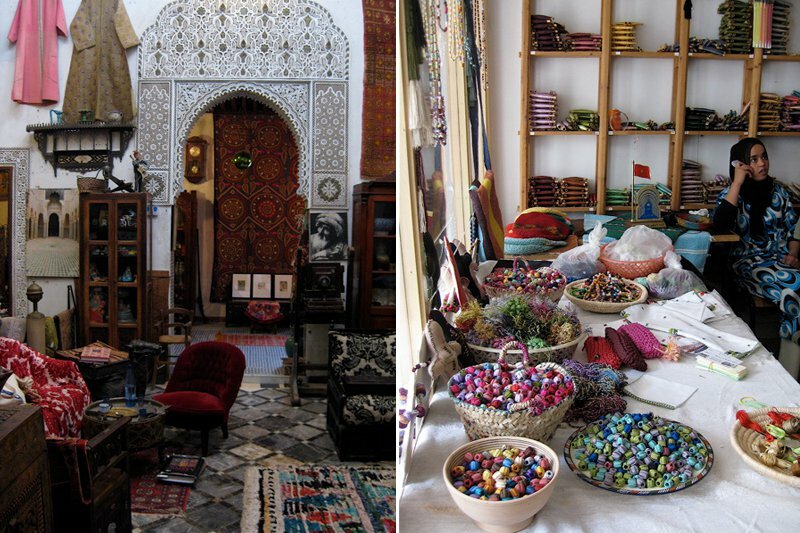 How many handmade Moroccan treasures can you fit in your suitcase? All photos by Joanna Williams. When in Fez, keep your eyes peeled and your mouth open (and your pockets lined with cash). Gentedimontagna contributor and global textile hunter Joanna Williams takes to the souks like a local. FEZ, Morocco – It feels like only yesterday that I was walking the cobblestone sidewalks of Fez, sampling street food and hunting for textiles. My mission was to source fabrics for and spend time with my best friend, who had recently moved from Los Angeles to show her daughters a different kind of life. I was extremely lucky to have her as my trusty guide. She speaks Arabic and negotiated hard on my behalf for pillow cushions and embroideries. She also introduced me to some Moroccan rituals that I have since incorporated into my daily routine, like dousing myself in pure argan oil and moisturizing with silky rose cream, all purchased in the medina of Fez. Nina took me to her friend Fouad's riad, . I highly recommend staying when you visit. Fouad had a Sufi band sing for nearly three hours to bless his riad. It was so beautiful I cried! Nina took me to her friend Adil's shop in Fez Jdid near the old Jewish quarter to look for textiles. We spent the entire morning shopping and ogling rugs, poufs, jewelry, and slippers. Afterward, we hit the streets in search of fava bean soup with olive oil, cumin, and cayenne pepper. It was the heartiest soup I've ever had, and definitely one of the best that's ever made its way into my mouth. We went to a cave in the village of Immouzer in the foothills of the High Atlas Mountains to look for textiles; to a co-op in Sefrou, south of Fez, to watch artisans work on their handicrafts; to the hammam (twice) for argan oil scrubs; and to every street vendor that sold Moroccan malawi, a flat doughy bread made with tons of olive oil. I became more and more entranced by Moroccan culture each day and wondered if I could live there. That question remains to be answered, but, in the meantime, I can still hold on to the hustle and bustle of the exotic city that is burned in my memory and appreciate the waves of nostalgia that come over me when I sip mint tea or have a Moroccan tagine at my favorite local cafe. Read about Joanna's Fez adventure on her blog. Parts , , , and . Buy the Joanna finds on her world travels. Joanna is the founder and owner of , a Los Angeles-based design studio specializing in vintage textiles that are sourced from around the world. She travels for the culture. Нашел в интернете нужный интернет-сайт с информацией про интерьер дизайн.